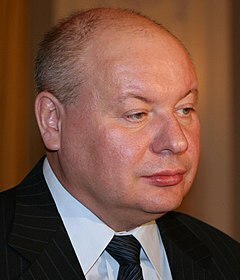 Yegor Timurovich Gaidar (Russian: Его́р Тиму́рович Гайда́р; 19 March 1956 – 16 December 2009) was a Soviet and Russian economist, politician, and author. He was the Acting Prime Minister of Russia from 15 June 1992 to 14 December 1992. ↑ 1.0 1.1 RIA Novosti Anton Denisov. "Post-Soviet reform architect Gaidar dies aged 53 | Top Russian news and analysis online | 'RIA Novosti' newswire". En.rian.ru. Retrieved 17 December 2009. This page was last changed on 1 April 2018, at 22:13.